We recommend the books and websites we have included on this page, but please note that we would not necessarily agree with every single word contained therein; neither can we necessarily vouch for any other materials by the same authors, or any groups or ministries or websites with which they may associated, or the beliefs of whatever kind they may hold, or any other aspect of their work or ministry or position. Likewise, our recommendation here of specific websites/pages does not necessarily imply that we endorse every aspect of that group or ministry. "The Royal British legion provides lifelong support for the Armed Forces community - serving men and women, veterans, and their families. 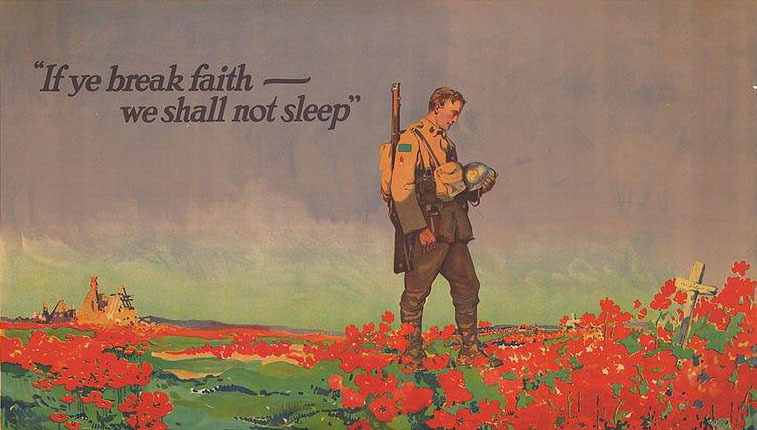 ... 100 years ago the First World War ended, and a new world began. The example and experience of those who lived through it shaped the world we live in today. ... In 2018 the Royal British Legion is leading the nation in saying Thank you to all who served, sacrificed, and changed our world..."
"The focus of this site is to offer an overview of the First World War battlefields on the Western Front in Belgium and France, showing you where they are and what you can see today. Established in 1998, the website is dedicated to the memory of more than 20 family members who served in the military during the Great War of 1914-1918." "Hello, Thanks for visiting the website. Please have a good look around and hopefully you might find it interesting. As you can see, the main purpose of this site is to inform people about a book project that I started in Autumn of 2006 and also for people to order a copy. It was one of those things, where there wasn't that much thought about doing it, it just sort of happened. What happened... well I started to hear from World War Two veterans. I had sent out an appeal for memories and also what they thought about the UK in the 21st Century. The second bit is important..."
"The poppy umbrella was inspired by Flanders poppies growing on the battlefields of the First World War in Belgium and France ... We supply the Poppy Umbrella to gift shops trading for welfare, educational and heritage organizations. Buying the Poppy Umbrella helps to support the work of these organizations in the UK, Australia, Belgium, Canada, and France..."
"Our mission is to 'help anyone affected by war', including the suffering shared by family members and friends too. All too often the many people who need this sort of help are worried about asking for help, they do not wish to be identified as being in need of assistance, especially servicemen and women ... Just reading poems or stories and realising that others have been through the same or similar things can be a great comfort..."
"The stories in this anthology are the winning entries in the 2009 FLOW for All short story competition. FLOW for All is dedicated to offering assistance to those who have suffered from the effects of war, especially the suffering shared by servicemen and women, their relatives and their friends. Proceeds from the sales of the book will be used to support FLOW for All, helping them to become a registered charity and to employ counsellors for those in need of care and support." In Parenthesis is "a deeply moving account of Jones' experiences in the trenches in the First World War ... What stands out is the fundamental decency and humanity of those men as they made their way to the slaughter on the front line. This journey is described with such brilliance that the reader becomes immersed in the moment and almost forgets the horrors that await ... 'This writing has to do with some things I saw, felt, and was part of': with quiet modesty, David Jones begins a work that is among the most powerful imaginative efforts to grapple with the carnage of the First World War ... Fusing poetry and prose, gutter talk and high music, wartime terror and ancient myth, Jones, who served as an infantryman on the Western Front, presents a picture at once panoramic and intimate of a world of interminable waiting and unforseen death. And yet throughout he remains alert to the flashes of humanity that light up the wasteland." "Jeff Haward MM is a 'Die Hard', the historic name given to men of the famous Middlesex Regiment. He joined the 1/7th Battalion, a machine-gun Battalion, equipped with the British Army's iconic Vickers medium machine gun. Following evacuation from Dunkirk, the 1/7th, while refitting and equipping, carried out coastal defence duties in preparation for the German invasion. So desperate was the situation that on sentry duty, the one rifle per section had to be handed to the next sentry, along with the only ammunition available - three rounds! In 1941, they were attached to the famous 51st Highland Division. The less than enthusiastic welcome from the Jocks gradually evolved into respect following the Middlesex's performance at El Alamein and the subsequent campaigns in North Africa, Sicily, Normandy and North West Europe." "They served across the globe: from the North African desert to the jungles of Burma, from the skies of Occupied Europe to the icy Arctic Ocean. 'The Unknown Warriors', as Winston Churchill named them, were the men and women who fought for the country during the Second World War. When an appeal for memories of wartime and what they think of their country in the 21st Century appeared in the local papers, many put pen to paper or dusted off their old typewriters to send in a response. The Unknown Warriors is a collection of letters, packed full of opinions and dramatic war memories from Land Army Girls, Far East ex POWs, Desert Rats, and RAF aircrew from Lancaster Bombers to name just a few, as well as from those who served in essential civilian services and occupations. It is a timeless record of written testimony from men and women who served their country with bravery and determination in the 1939-1945 War." "The gallant rearguard action which led to the capture of the 51st Highland Division at St Valery-en-Caux (two weeks after the famous evacuation of the main British army from Dunkirk) may have burned itself into the consciousness of an older generation of Scots but has never been given the wider recognition it deserves. The introduction to this collection of first-hand accounts re-examines that fateful chain of events in 1940 and reassesses some of the myths that have grown up in the intervening years ... These vivid accounts bring alive the chaos and horror of war and the grim deprivation of the camps and forced marches which so many endured. Yet these personal stories resound with the spirit, humour and sense of comradeship which enabled men to fight on in desperate situations and refuse to be cowed by their captors."